Welcome to part three of our advanced maintenance metrics series. We’re going through the what, why, and how of the KPIs that you should be tracking with your CMMS software. 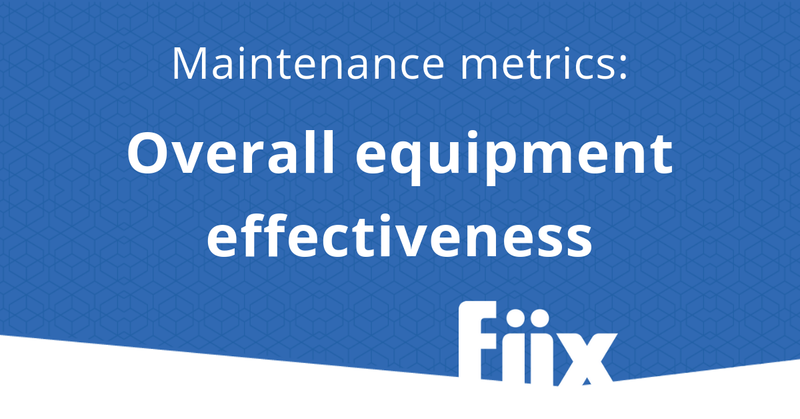 Today’s metric is overall equipment effectiveness (OEE). Availability = The system is functioning when it is needed. Performance = A measure of system throughput divided by its maximum throughput. Quality = The number of good units divided by total units started. OEE excludes planned shutdowns such as preventive maintenance, holiday shutdowns, and periods when there are no orders to produce. When you subtract this planned downtime from total plant operating time, you are left with planned production time, which is used to calculate OEE. The ideal manufacturing facility is one that produces the best product, as quickly as possible, with no unscheduled down time. This is an OEE of 100% which is difficult, but not impossible to achieve. For discrete manufacturing plants, world-class OEE is generally considered to be 85% or better, however, the average OEE score is ~60%. OEE is a good indicator of machine or system productivity. It can also give insights into the behaviour of personnel maintaining the system. A bad maintenance technician will spend the day running around putting our fires. They’ll fix the problem but they won’t prevent it from happening again. A good maintenance technician will perform regular inspections to spot failures before they occur, perform recurring scheduled maintenance and implement measures to prevent further failures. OEE also provides a way of measuring the success of manufacturing, productivity or lean initiatives such as TPM. In today’s fast paced economy, manufacturers need to find ways of getting a step up on the competition. Efficiency is one area where every manufacturing plant can improve. If you don’t know your overall equipment effectiveness, then you don’t know how efficient your plant is or how efficient it could be. You can calculate the availability element of the OEE equation using your CMMS, but it’s important to keep in mind that maintenance activities can impact all three elements of OEE. A preventive maintenance solution is the ideal tool to track your scheduled maintenance and inspections so issues can be identified before they turn into something more serious. According to David Berger of Plant Services, a CMMS could deliver a 10% increase in availability, a 5% increase in throughput and a 5% increase in quality of output. A fully functioning CMMS coupled with a solid preventive maintenance philosophy can mean big improvements in OEE.